Prawn Cocktails, also known as Shrimp Cocktail, swept the party scene at the turn of the century. This seafood dish was the most popular hors d’oeuvre in Great Britain in the 1960s and into the late 1980s, but the United States picked up on the trend decades earlier. Some sources link the serving of the dish in cocktail glasses to the ban on alcoholic drinks during the 1920s prohibition era United States. The dish is simple but was reserved for only the most sophisticated: it consists of shelled, cooked prawns in a cocktail sauce service in a glass. Though many Americans now buy pre-made, store-bought cocktail sauce, this homemade recipe is a simple, fast, and delicious way to elevate any dinner party you want to throw. Place the water, carrot, celery, onion, garlic, lemon, parsley, thyme, and bay leaves into a pot and bring to a boil over high heat. Lower the heat to a simmer, then place the cover on top (slightly ajar) and cook for twenty minutes. Drop the shrimp into the simmering liquid and turn off the heat. Cook the shrimp, stirring occasionally, until they curl and turn punk—between two and three minutes depending on the size of the shrimp. Drain the shrimp and cool to room temperature. Then, peel the shrimp and remove the vein along the back curve. Refrigerate if not serving right away. Combine ketchup, lemon, horseradish, Worcestershire sauce, and hot sauce in a small mixing bowl. Mix well and refrigerate until ready to serve. To serve, bring shrimp to room temperature for twenty minutes. Put cocktail sauce in a medium bowl and surround with shrimp. For individual glasses, pour cocktail sauce into a cocktail glass and place shrimp around the rim. Garnish with lemon and serve. A classic party food for the ages, Deviled Eggs date as far back as ancient Rome. However, the dish gained worldwide popularity in the early 20th century, making its way onto party platters around America. Also known as stuffed eggs, Russian eggs, and dressed eggs, this dish involves hard-boiled eggs that have been shelled, cut in half, and filled with a paste. The paste is most often made from the egg yolks from the hard-boiled eggs mixed with other ingredients, such as mayonnaise and mustard. Generally served cold and as a side dish or appetizer, this popular food is simple, delicious, and a classic served at the House of Shields. Once peeled and halved, scoop the egg yolks out of the hard-boiled eggs and deposit into a large mixing bowl. Set aside the egg whites. Add the mayonnaise, mustard, vinegar, sugar, and salt to the yolks. If desired, add pepper to taste. Mash the ingredients together with a fork or potato masher until smooth. For a quick shortcut, use a tablespoon to deposit the mixture back into the egg white halves. For a better presentation, load the egg yolk mash into a piping bag. Squeeze the yolk mixture into the egg whites. Garnish with paprika and optional cilantro. For traditional serving, chill for one to two hours before enjoying with friends and family. Traditionally served cold, Vichyssoise is a thick soup made of boiled and puréed leeks, onions, potatoes, cream, and chicken stock. Nobody is certain of this classic soup’s origin—though Julia Child called it an “American invention,” historians debate its roots in French cuisine. A similar potato and leek soup recipe was created in 1869 by the French chef Jules Gouffé, but another French chef—Louis Diat, based at the Ritz-Carlton in New York City—is credited with its reinvention. Though it is traditionally served cold, I can also be eaten hot. The recipe is simple, easy, and timeless. In a large pot, melt the butter over medium-low heat. Clean and slice the leeks, discarding the green ends. Cut the potatoes into small cubes and finely chop the leeks. Add leeks to the butter and let sweat for five minutes. Stop sweating if they begin to take on color. Add the potato cubes and cook for another two minutes, stirring occasionally. Add chicken broth to pot, stir, and bring to a boil. Reduce heat to a simmer, cooking on low heat for around 35 minutes—until the leeks and potatoes are very soft. Remove from heat and let cool for several minutes. In small batches (1-2 cups at a time), puree the soup using a high speed in your blender. When finished, return the soup to the cooking pot. Whisk in cream and nutmeg, then season soup with salt and pepper to taste. Return to a boil, reduce to a simmer, and cook an additional five minutes. If the soup is too thick for your liking, add more broth. Transfer soup to a mixing bowl and chill over an ice bath, stirring occasionally. When the soup is at room temperature, cover in plastic wrap and put into the refrigerate to cool. Season to taste, top with chives, and serve in chilled bowls. Named for the inimitable John D. Rockefeller, this recipe was created in a New Orleans kitchen in 1899. Jules Alciatore developed the dish to address a shortage of escargot; the locally-available oysters provided a suitable substitute. The dish is characterized by a special green sauce and the inclusion of bread crumbs, which are then baked or broiled. The green sauce recipe has never been revealed in an official capacity, but it likely includes a purée of green vegetables, parsley, celery, chives, and capters. Simple but indulgent, this is a great way to eat oysters. Use an oyster knife to open the shells and remove the oysters. Discard the top shells, but scrub and dry the bottoms. Drain the oysters over a bowl to reserve excess liquids. Melt the butter in a large saucepan. Add the spinach, onion, parsley, bread crumbs, Tabasco Sauce, Pernod, and salt. Remove from heat and let cool. Press this mixture through a sieve and let cool. You may make this mixture ahead of time and keep refrigerated until use. Preheat your broiler. In the meantime, line an ovenproof plate with a layer of rock salt (1” thick). Set oysters in the rock salt, placing a bit of the reserved liquid on each oyster. Then, spoon an equal amount of the prepared spinach mixture over each oyster, spreading to the rim of the shell. Add breadcrumbs. Broil for approximately 5 minutes (or until the edges of the oysters have curled and the topping begins to bubble). Garnish serving plates with parsley springs and lemon wedges. Serve immediately. A classic gin cocktail, the Aviation was created y Hugo Ensslin, the head bartender at the Hotel Wallick in New York. First served in the early 20th century, the recipe was published in a 1916 mixed drink book. The cocktail can be considered a variation on the gin sour and is made with gin, maraschino liqueur, crème de voilette, and lemon juice. It should be served straight up and in a cocktail glass. Add all ingredients to a cocktail shaker and fill with ice. Garnish with a cherry (fresh or maraschino). Aw, man. You want to talk about a place that invokes the speakeasy era, how about an underground restaurant and bar that uses a different business as a cover? 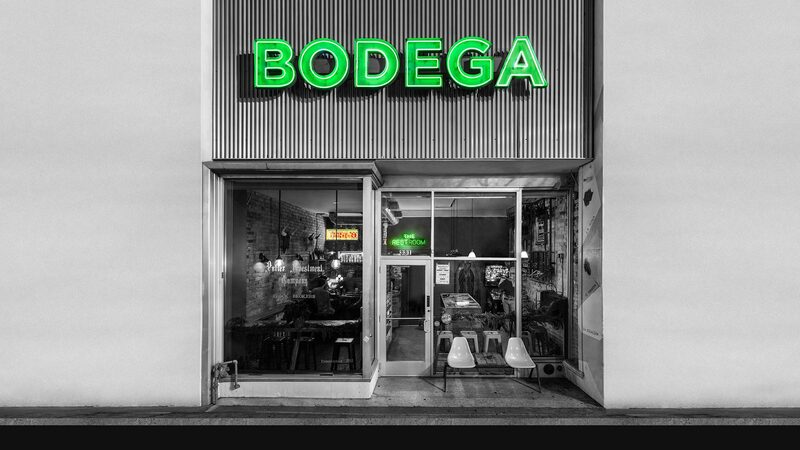 The Rest at Bodega 331 is located at an old location for a stock broker and investment company. Through the backdoor “Rest” Room, you’ll find your way down to the basement where Salt Lake City boasts a legit speakeasy environment unlike any other we’ve seen. With local macabre art, dimly light environs, and a kitchen that sits in an old bank vault from the earliest years of the city. The seating area is long and narrow with a larger front room and smaller back room. You get the unmistakable feeling of going through a time-warp. If you’re like us, you’ll go with a half-full stomach and a small group of friends to share drinks and split appetizers and meals. You’ll talk about pseudo-sordid topics and make pseudo-sinister plans in hushed whispers and with an inflated sense of importance. If you’re like us, that is. The Mint Julep is a bourbon-based cocktail associated with the American South, originating in the southern United States in the late 18th century. Since the early 20th century, the drink has been promoted in association with the Kentucky Derby—each year, nearly 120,000 juleps are served at Churchill Downs over the two-day period. A Mint Julep should be served on the rocks and in a highball glass, preferably on a very hot and humid day. Combine the powdered sugar and water at the bottom of a highball class. At the mint leaves and muddle. Add bourbon and pack tightly with crushed ice. Stir until the cup is slightly frosted on the outside. Serve with more crushed ice (forming a dome) and garnish with a mint spring. Add bitters to top if desired.